Is it really the end of the year? Where did it go? It certainly has been a year of ups and downs for our family!! We certainly feel blessed this year and looking forward to 2008 with much anticipation!! Rene you are the final winner in our countdown to Christmas games. Thanks to all that played, it was fun getting to know each of you just a little better. Please be sure I have your address if you were chosen as a winner, the packages are ready to go out just waiting on some addy's. Please email address to info@kisscropnshop.com. Have a fantastic day everyone!! Don't forget to sign up for our January 12th Scrappin' U. Reservations must be made prior to January 10th. Details and registration are available at www.kisscropnshop.com. We've also listed our scheduled events for 2008 on the website, be sure to mark them on your calendars!! Wow!! Isn't it amazing how we wait and wait for Christmas to get here and then it's gone, over just like that? We had a great Christmas, lots of time with family and the food....well I'm not eating for the rest of the week. Don't need to!! So we've got one last day of prizes so let's get to it. Oh, the winner of the last round....Carol. Thanks so much to everyone for sharing, I just love getting to know each of you better and it's fun to see what others do during the holidays. TO ALL WINNERS: Please make sure I have your mailing address, I'm going to try to get all the goodies in the mail by Monday. Since we've got our presents, let's tell what we got! I love, love, love watching others get gifts. My mom is always very excited and she loved the snowman wreath I had made for her. She squealed, which is always fun. Emma doesn't ever get really excited, she gets more quiet when she likes something so she hardly made a sound but loved her presents from Santa. Tyler is in the middle, not too excited but does get a little more so than Emma. I on the other hand was very excited to get some toe socks!! Yep, always thought no way would I wear those but Emma got me some and so I tried them, LOVE 'EM. Going to get me more!! I was burned badly on a floor furnace as a baby and have terrible trouble keeping my feet warm in the winter. The toe socks are great, nice and toasty for the toes and ohhh so cute!! I was equally excited about my Sonic gift card from my dad. Look out Sonic happy hour, hope they stocked up on my vanilla diet cokes!! So tell us about your fun and we'll draw our last winner tomorrow. Be sure to post by 10:00pm tomorrow to be entered! You are today's winner, congrats and I just know you're going to love your goodie bag of assorted embellishments!! Tonight, let's talk about your plans for Christmas. Do you stay at home, travel to family, hop from house to house? We will go to my Aunt's house tomorrow afternoon to make our annual gingerbread houses. This is a tradition that Aunt Julie started years ago and we do it every year. Love seeing what the kids do to their houses! Tomorrow night we'll go to my in-laws for dinner and exchange gifts. Nothing formal just a laid back (well as laid back as you can get with 7 kiddos and presents!) When we get home the kids, Greg and I exchange our gifts. Christmas morning my parents come out bright and early to see the kids get Santa gifts. Greg fixes breakfast and we give our gifts to them. For lunch we usually have a big McDermott lunch but this being the first year without Nanny they have decided not to do that. Not sure why, it's going to be very hard not to!! We miss Nanny sooooo much!!! Instead we are going to the in-laws again for a small lunch and to my mom's for supper and gifts with my brother. That's it!! Whew!! I'm tired just typing it but I know many of you run much more than that. Thankfully we only have to travel about 10 minutes to any of our destinations! So tell me about your plans and you may win like Nancy did!! Post by 10:00pm tomorrow and we'll draw after breakfast on Christmas Day for our winner! Myra!! Emma's going to be upset when Christmas is over and she doesn't get to draw names anymore. I was surprised today when I opened the mailbox and got several cards from friends I hadn't heard from in some time. Love the pictures, the notes, the letters that come in the cards. Now I have to admit, I didn't get any cards sent out this year at all. Bought them (gasp! Yes, I bought cards and didn't make them) and they are sitting on the cabinet. Some are written in but most are not and none are mailed!! Perhaps I'll mail them after Christmas. I always have great intentions to get cards out but it rarely happens. I have an awful time getting out Christmas cards but do send cards many times during the year for all occasions. So let's hear what you do. Do you make or buy cards? Do you mail them or do they sit like mine? Do you sign your name or write notes or letters? Do you include photos? How do you display the cards you've received? Post by 10:00 tomorrow night to be entered into the drawing!! Wow, is it just me or is Christmas coming faster this year than years past? I can't believe it's only four days until Christmas, hope you all are ready!! So tonight let's talk food!! What's your favorite food of the holidays? Do you make your own cookies or candies? Do you prepare a large meal or special dish? Wanna share a recipe for all of us? My favorite candy of all time is peanut clusters, love them!! I'm not much of a baker but I sure do like to eat all those yummy candies and cookies that are made this time of year much to the demise of my jeans. Hubby is going to make his potato soup for dinner at his parents. That's about all the food we have to prepare this year. No big meals so guess I'll have some extra room for the junk food!!! Post by 7:00pm tomorrow and you'll be entered into the drawing. Our lucky winner from yesterday, Liz! Congrats and I'm sure you're going to love your rub-ons that will be arriving after Christmas!! **Terri, I can't believe you are that close to me after all these years!! We'll have to get together soon!! Are you counting down the days? My daughter is!! Just about every 30 minutes we are having to count down the days until Christmas!! :-) She's very excited this year! Miranda as winner of our last round I hope you are as excited with your goodie bag of ribbons!! Thanks everyone for sharing! Angela, we need to see pictures of the baby!! Hope everything went well and we need a full update, name, weight, you know all the good stuff!! So today let's talk about the presents that you have given. Who is the hardest person for you to buy for? Do you make or buy gifts? Do you shop until you drop for the perfect gift or is it gift cards all the way? Who is the most fun to watch on Christmas? What's been one of your favorite gifts you've ever given, why and who was it given to? My favorite gift was the year I made my dad a 6 x 6 album based on the book Every Daughter needs a Dad by Gregory Layne. I filled it with pictures of him and I during my childhood along with sayings from the book. It was a great project to work on, brought back lots of memories and it was great to see his reaction. Another favorite was the year we filled my mom and dad's stockings with all kinds of gag gifts. It was so fun laughing as they opened each gift!! My mom is hard to buy/make for. She has everything and what she wants she buys so it's always a challenge to find her something. My son is getting harder as he gets bigger. His "toys" are getting very expensive, LOL!! Post today on the blog by 10:00pm and be entered into today's drawing!! Happy sharing!! IMPORTANT ANNOUNCEMENT: Our message board at www.kisscropnshop.com has been hacked! We've shut it down until we can get it cleaned up so all important announcements, updates, etc will be made here on the blog. Be sure to sign up for the newsletter on the blog so you don't miss anything!! First of all, congrats to Sara!! You are the winner from yesterday!! Hope you enjoy your fun ribbons that you've won!! I also hope you all are enjoying reading and getting to know each other a bit through this Christmas countdown! I love hearing all the fun stories and can't wait to see who all post each day! Thanks for playing along. Remember, all you have to do is post on the blog and you can win!! We draw one persons name each day (Emma, my daughter is having a blast doing that) and the lucky winner will get a goody mailed to them just after Christmas. It's that easy!! So since we talked about whether we were shakers, peekers or can't find out types let's share our favorite Christmas gift ever received. We all know that the greatest gift is Jesus and that's the reason we even have Christmas but let's talk about the material gifts now. What gift meant the most, surprised you the most, touched you the most? Was it something you asked for? Something totally out of the blue? Who gave you the gift and why did it mean so much? I think mine would have to be the little lifesaver candy books that my grandma gave each of us for Christmas. She couldn't afford much but made sure we had those candy books every year. Now growing up it didn't mean so much and wasn't even very exciting but looking back and now that she's gone, that is something I treasure and every time I see one of those I think of Grandma. Let's hear about your gifts...... we'll be drawing tomorrow so be sure to post by 5:00 pm Wed. to be entered into the drawing for today's gift!! Are you a peeker, a shaker, an I don't wanna know girl? Let's talk about presents today!! Not what we want or what we are giving BUT...........do you peek, do you shake? C'mon be honest!! You've never peeked at any gift ever? My sister and I would sneak in and very, very carefully peel back the corners of our presents just enough to show what was inside, quickly wrap them back and act so surprised when it came time to open the gifts. One year we even found the entire stash before it was wrapped, now that sure made peeking easier!! I don't peek anymore unless I think I'm getting something really good from my mom. I may try to find out before then!! We do allow shaking and quessing in the house. It's just too fun not too! They guess some funny things and are usually tricked by the packaging! I'm trying to prevent eeking around here so we have a rule if they find out what it is, it goes back and isn't replaced. Isn't it fun to get to be the mean mom????????? :-) My entire family is known for hiding tiny presents in HUGE boxes or putting joke items in the box or even better wrapping a series of boxes only for them to be empty with the present waiting in the background!! Any funny stories you want to share with us? Share today by posting on the blog by 10:00pm today and you'll be entered into a fun drawing for a free present of your own!! Remember the rules, the same person may only win five times between now and Christmas day. All prizes will be mailed after Christmas so you can play with them in the New Year. It's that easy so come out and play!!! The winner of yesterday's traditions post is: Liz! Congratulations Liz and just for sharing a little about your Christmas traditions you'll be getting a goody bag of Scrapworks tailored tabs to play with! Be sure to email me at info@kisscropnshop.com with your mailing address. Carol Raben!! Congratulations Carol and thanks to all that shared about their Christmas decorating. It's always fun to see what others do. I can't wait to see what Carol is going to do with her custom Santa word book!!! No one in this house is feeling well so we are going to make it easy tonight. Let's talk about family traditions. Either ones that have passed down through generations, new ones you've started or something you'd like to start. I'll share some of ours tomorrow, for now I'm going to bed. Hoping to shake this yuck off before class tomorrow! Goodnight and have fun sharing. We'll draw from those that share their traditions by 5:00pm tomorrow. Be sure to post them here so we can all get to know each other a bit better!!! As I sit wrapping presents today I wonder how many of you are like me? Does your tree have to look just right, only certain colors, ornaments, etc go on the tree? Or do you have random ornaments, multi-colored lights, beads, feathers? Do you deck out the entire house or just hang stockings? Do you have collections of Santa's or snowmen? I'm very picky about my tree. Nothing goes on it but the red and rustic gold ornaments, scented pinecones, poiensettas and clear lights of course. My tree is pretty rustic and makes me feel all warm and fuzzy! I just love it!! It's a fake one, pretty big and full and just soooo pretty!! (I think so anyways!!) Now my kids each have a tree in their rooms where we put all the fun little trinkets they make and get and any other ornaments we may get through the year. Anything goes with theirs!! Ohh... and I have to have matching wrapping paper! I never use the same from last year and it takes me awhile to find the perfect wrapping paper that will look just right under the tree!! I'm also pretty picky about how my boxes are wrapped. The ends have to be straight, no sloppy corners in this house! I don't put out many decorations anymore, a few Santa's that I've been given over the years but that's about it. I used to go nuts with decorating but find it's soooo much work to take it all down, that and Mr. Scrooge isn't so happy in the house with all the fru-fru stuff out!! :-) We do have co-ordinating stockings of course! So now you know how I decorate my tree and home, let's hear about yours!! Everyone that post HERE on the blog about your tree, how you decorate your home, your wrapping paper fobias, whatever you want to share with us will be entered into today's contest. One lucky winner will get the prize of the day. You have until midnight tonight to post and a winner will be announced tomorrow. Carol Wehner!! Carol will be getting some fun Queen and Co. felt fushion to play with!! Wow!! We already have a winner for day 1! I'll post the titles, the prize and the winners name in the morning. I'm having trouble staying connected to the internet tonight! Thanks for playing and watch for more fun and games tomorrow. So are you busy shopping, making cookies and decorating or are you like me and rushing around not getting anything at all accomplished? I finally do have gifts under the tree and they are even wrapped!! Still have lots to do in the next week or so but I'm ready to have some fun with you so let's begin. The rules: Each day, I'll be posting a fun little game, quiz or contest. You must EMAIL your answers and mailing address to info@kisscropnshop.com. You may only win once per day and a maximum of five times during the 13 days. I won't be telling you what you are playing for until the winner is announced. I may slip in some hints here and there so follow closely!! You'll never know what the next days prizes may be so you'll have to choose your days you want to play wisely!! I'll be mailing ALL winning packages out AFTER Christmas so you can have some fun with your goodies in the New Year. I will be posting the contests at different times during the day and evening in order to try to make it fair for all to have a chance to play. I will create a new post as soon as I have a winner for each contest. HAVE FUN!!! Today's game: One of my favorite things about Christmas is the music. I love listening to Christmas music although living with the real life Christmas Scrooge I usually only get to listen to it in the car. Let's play a round of name that tune. The first person to email me the correct answers to all of the songs will win a goody fit for a queen. Please play honestly, this is for fun... see if you can do it without looking up the names. How well do you know your Christmas songs? 1. He knows if you've been bad or good So be good for goodness sake! 2. We want some figgy pudding, Please bring it right here! 6. My world is changing, I'm rearranging. Does that mean Christmas changes too? 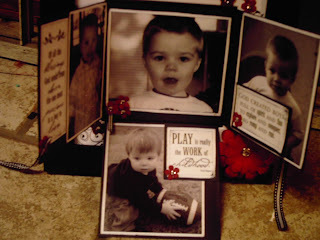 I've actually gotten to scrapbook or at least shop for scrapbook goodies several times in the last two weeks. It feels great and I'm thinking perhaps I've gotten inspiration enough to create some fun new kits. Take a peek and see what ya think. These are available now simply by emailing me at info@kisscropnshop.com. Yummy Rusty Pickle papers are used in both of these kits and of course custom paper piecing, ribbon and fun embellishments!!! Limited quantities currently available on both of these. Oh and by the way, if you ever wander down towards Claremore, OK be sure to stop in at Simply Scrapbooks. Cute store, good selection of products especially if you are a fan of the Cricut. I don't have one but know many of you croppers do. They carry a fantastic selection of the cartridges and supplies. I believe they are running a great special on the new software program for the Cricut now too. Speaking of stores, there are some walls up at the new scrapbook store in Neosho. It's great to see small scrapbook owners still hanging on in the industry that seems to be eating up all the small potato's of the scrapbook world. I think the past few weeks I've been doing my part to help the individually owned stores stay in business much to the demise of my checkbook! :-) It's for Christmas gifts or kits so that's okay right? So let's hear where you like to shop? Online, chain stores, scrapbook store? Any great specials we need to know about? 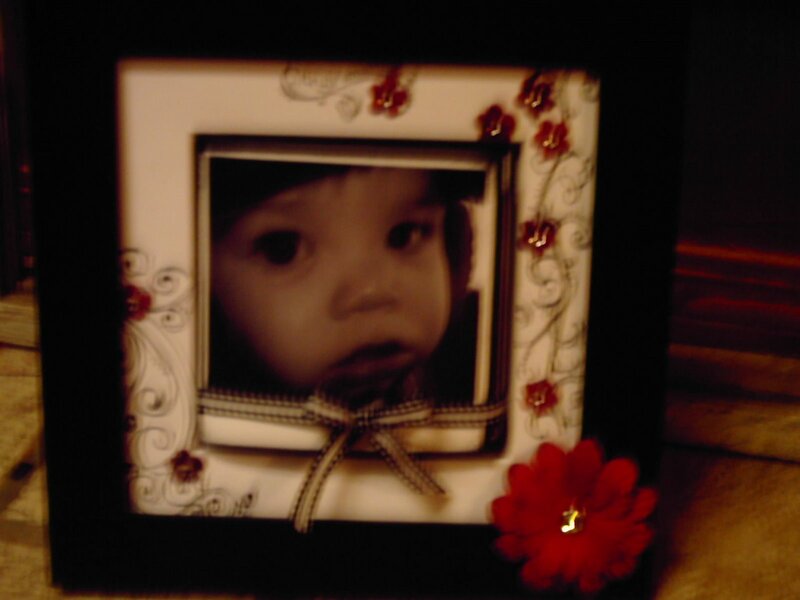 Oh and if checking out online specials checkout http://licketysplitscrapbooks.com. Wendy's been adding all kinds of new kits lately!! Happy shopping!! Are you ever too old to sit on Santa's lap? NOPE!! My mom, sister and I did last week and it was soooo much fun! Of course I couldn't share my picture with you until I took Emma to see Santa. That would have been a bad mom right?????? 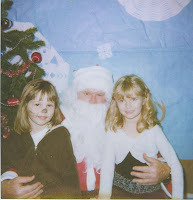 So here are are pictures of our family visiting Santa. Now here's hoping he brings me the goods I asked for! HA!! Emma and Ryli were both pretty nervous about sitting on Santa's lap although they both managed to tell him what they wanted! Stacy, my sister wanted to sit on Santa's lap really bad but he wouldn't let her!! Hmmm...wonder if she's been bad and getting coal this year? Speaking of Santa? I'm feeling a bit like Santa and am ready to give away some goodies, play some games and have fun!! Are you ready? We'll begin tomorrow on the 13th and play everyday until Christmas so be sure you check in each day for some fun! A late night scrapper alone. "He hid my darn Herma fix! "The poor wife was shuttering! And dropped her Magic Matter. Bringing more for her stash! It was Jolee old St. Nick. Not yet in the stores! "Those Whale Punches are heavy!" "On Buyer and Stasher,Puncher and Cropper. And pulled a camera from her sleeve. Of the layout she'd make! And she heard him exclaim. "Happy Scrapping to All" And to all, "HO HO HO!" My mom, sister and I delivered the pages and albums to Alexandra's House and all I can say is wow!! The home is so warm and welcoming. We were able to view the wall of life which is two walls in the home decorated with photos of the children and families that have been assisted through Alexandra's House. You couldn't help but stand there and cry and count your blessings!! Beautiful babies, tiny hands, conjoined twins, lots of hair, heads covered with blankies with big sparkling eyes looking back at you, proud mom's and dad's. I'm telling you if you ever have a chance to visit this home and experience these lives you must do it!! Thank you from the bottom of my heart for all the work you ladies put into those pages. I'm so excited to know that families will be getting an album and able to fill it with pictures of their little ones. What a blessing you've been able to give them!! Wow! What a week so far!! Well it started last Friday but I got to scrapbook!! How cool is that! I went with a group of friends to Signed, Sealed and Delivered in Bentonville, Arkansas Friday night. We had a baby shower where we all sat and made pages for the momma-to-be so I wasn't scrapping for me but it sure was fun!!! Of course, found some cool new papers that I had to have!! That store is by far the very best in our area at keeping up with the newest products, the most helpful staff and just overall a great store!! Seen some of our cropping buddies while there! Hi girls!!! 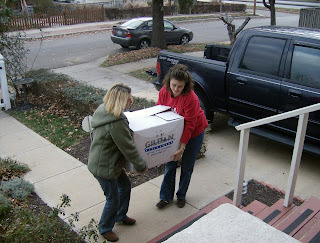 Tomorrow mom and I will be going to Kansas City to deliver all the pages, albums and donations for Alexandra's House. I am so excited and can't wait to get them into the hands of the families. I'll be sure to post some pictures for you all to see. We'll also be spending the day with my sister and hopefully doing some Christmas shopping. I haven't gotten one thing and that's so not like me. I'm crossing my fingers that I find lots of goodies tomorrow and get it done. Saturday I'll be scrapping all day at the First Christian Church in Joplin. We'll be holding Scrappin' U a very laid back, fun day of nothing but scrapping, eating and chatting with friends. We'd love to have you join us, we've got LOTS of space to spread out and I'm bringing Greg's famous potato soup!! Check registration out at http://www.kisscropnshop.com/. Have a great day Wednesday!!! Wanna see my teacher's gifts? Here are some not so great pictures of the teacher's gifts we made this year. Very simple, fun and easy to do. We're going to fill them with M& M's and add a cute little tag. Wanna make some? I used EK Success Art Blanche' Milk Cartons but only had four and Emma wanted more so here's how we made them: Get the kid's milk cartons, sterilize them, cut a small opening in the side using an exacto knife. You, of course wouldn't have to have the opening. They'd have to open it to see what's hidden inside. Attach a piece of vellum to the opening from inside the carton to keep the contents in the carton. Cut paper to fit sides of carton, add smaller pieces of coordinating papers, ribbons, rub-ons and of course ink to cover those seams. Fill with candy and viola! You are done!! So come on, what goodies are you making this year? Let's get this started again!! Okay, so now that I've got most of the family feeling better (Greg's hacking and coughing now!!) and my computer is up and running for today let's get to sharing again!! 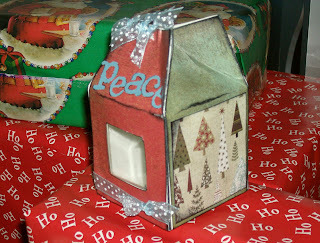 I'm working on a twelve days of Christmas contest so be watching for details on the blog. It should be lots of fun, it will be easy and there will be prizes. How does that sound? Don't forget to check out Scrappin' U! We'll be meeting December 8th and registration is now open. She loved it and I had so much fun making it that I'm going to make some for gifts this year and one for me! That's right, I'm making something for me!! So what are you working on? Christmas gifts? Christmas cards? Home decor items? Share your ideas, I love hearing what you all are making and if you want to share pictures with us send them to info@kisscropnshop.com, I'll add them so everyone can see. 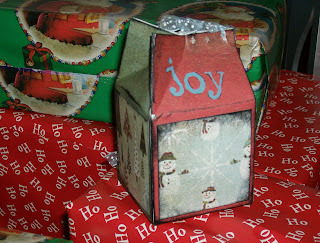 Tomorrow I'll add a picture of the adorable milk cartons I'm making up for teachers gifts. Too cute, fun and sooooo easy!! !